Draft rules are unlikely to contain an exemption to state law barring smoking in public places, so pot would have to be consumed through edibles or tincture. Maine may be the first state in the country to license marijuana social clubs, but the pot could not be smoked in the clubs and would have to be consumed in another manner. The legislation to regulate adult-use marijuana under consideration in Augusta now would push club licensing off until at least June 2019, about a year after Maine’s first retail stores are likely to open. Although not thrilled with the delay, most legalization advocates say they are just happy that club licensing was not stripped out of the bill, which is a legislative rewrite of last November’s successful citizen initiative. The bill does not expressly prohibit smoking in the clubs, but it also doesn’t carve out an exemption to the state’s no-smoking law, which bans smoking of any kind, including vaping, in public places such as bars and restaurants. That means the clubs would be limited to the sale of pot edibles or tinctures that patrons would have to use on site, said state Sen. Roger Katz, R-Augusta, co-chairman of the Legislature’s Committee on Marijuana Legalization Implementation. Maine law currently allows smoking in cigar bars, but Katz said a majority of committee members didn’t want to add a smoking law exemption for marijuana. The bill is still in draft form, however, so it could undergo many changes before it is sent to the full Legislature for a vote next month. A public hearing on the bill is scheduled to begin at 9 a.m. Tuesday at the State House in Augusta. Advocates in Maine are pleased that the bill would allow club patrons to buy and use marijuana in the same location, but they argue that the 2019 licensing date is too late. They want cannabis social clubs to have the same rights as alcohol and tobacco clubs. A city like Portland should be able to license a marijuana club with a rooftop patio that would allow outdoor smoking, said advocate David Boyer. Boyer’s organization is considering a petition drive in Portland to establish local licensing rules for social clubs that would be ready to implement in order to speed up the process once the clubs are approved. That might not be necessary, however, because city officials are thinking along the same lines and are already planning a fact-finding trip to Denver. But legalization opponents say social clubs are just one of the reasons they lobbied against the ballot question last year. The leader of Mainers Protecting Our Youth and Communities, Scott Gagnon, has said social clubs would put more impaired drivers on Maine roads. Since no state has yet licensed social clubs, there are no data available on whether they would lead to more traffic accidents or fatalities. Data on the impact of legalization on traffic safety are mixed. Like many other states, Maine has had its share of underground marijuana-friendly clubs, and certain parks and beaches are popular spots to use marijuana with different degrees of discretion. The adult-use law adopted last fall allows adults to grow six plants on their own property or someone else’s, with permission, and have up to 2½ ounces of marijuana in their possession for personal use. Current law bans public cultivation or consumption, which doesn’t give the 36 million people who visit Maine each year a place to use any pot that they might buy when here, because most hotels ban smoking inside rooms. Club advocates have said pot lounges would give tourists a legal place to use the pot they buy here and keep them out of the parks and off the beaches. But a review of other states’ marijuana laws and regulations reveals that marijuana clubs remain uncharted territory in the national landscape. Even in Colorado, which was the first state in the nation to legalize recreational marijuana, government officials have been reluctant to license pot clubs, worried that it would invite federal authorities to crack down on a drug that is still illegal under federal law. 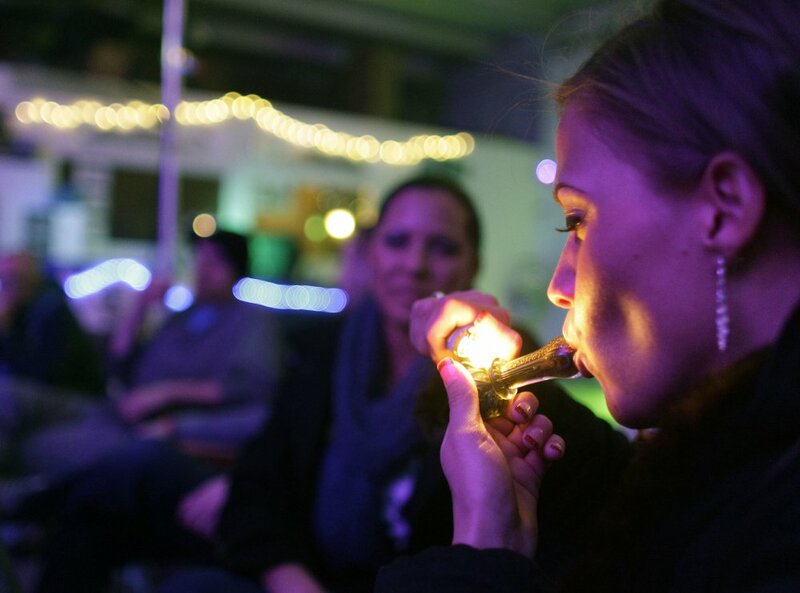 Oregon does not allow pot social clubs. Alaska and California are considering whether to license them. California, Nevada and Colorado laws do not prohibit clubs, so local governments could agree to grant licenses. So far, only Colorado City has any licensed social clubs, where consumers can use pot they bring with them – but even those are under order to shut down by 2023. Denver adopted a pot social club pilot program and announced it was ready to begin accepting applications last month, but so far no one has applied. Would-be club operators say the rules are too restrictive, partly because they ban consumption at places that sell marijuana, essentially making clubs a bring-your-own venue, and require clubs to be twice as far away from schools or playgrounds as bars. Massachusetts law allows social clubs in local municipalities, but the newly appointed Cannabis Control Commission will likely take up that issue while it writes state regulations. A Denver-based party bus service, Loopr, which bills itself as a mobile cannabis lounge, is targeting Boston for expansion into New England next year, as well as having franchises in California and Nevada. Freedman’s firm is now taking on state clients to advise them on how to set up their adult-use markets, and would like to find work in Maine.